This post is about hanging art in my home but first a brief announcement. Everyone is invited to my painting exhibit, "Water Speaks,” opening tomorrow Sunday, October 22 at the Main Albany Public Library upstairs in the periodical area between 1:00 PM and 3:00 PM. The library is at 2450 14th Ave SE. The paintings can be seen during regular library hours until October 31st. I am Diane Widler Wenzel, a fine arts painter with a large collection of my own art. Over the past 65 years I have sold some of my art but still have a big representative collection of my own creations. I like to live with my paintings so I rotate them. I swithch paintings around every time I start to clean house. Revolving art gives me a lift in spirit like living in a newly remodeled home. A recent epiphany came to me while washing windows and hanging 114 works in my home to show to possible clients. The way paintings are displayed in a home can change how we feel. You bet they can. Painting groupings can even improve how I feel about my spouse's habits and different likes. My husband Don and I live in a 1950's vintage, 1,200 square foot, one story, ranch style house. The living room is long and narrow with a long gallery wall facing a large picture window providing north light.This gallery has expanded over the years to every available wall space in the house creating an uncomfortable, visual stimulation overload. Bright active paintings were jumping out at us everywhere. So I have come up with ideas on how to hang more and more paintings so they both energize and sooth us. My aim is to make our home beautiful for both of us. When hanging my painting I consider the views of my work from the locations we occupy during our daily doings. For 32 years on my living room gallery wall I have auditioned my latest work next to older pieces for comparison. Also, I view them here before choosing the final touches. Since my epiphany I understand Don and I view the wall differently from our different easy chairs, the computer, the coach and when we enter the house. Don and I gravitate to different places with different views of my paintings so I can select his favorite impressionistic works where he is most likely to see them. I place more abstract warm and active paintings in the locations I see them. I didn't use to think as deeply of how my work was effecting Don. Now I understand that my husband and I want to live in a comfortable space for both of us where we can be free to spread out our activities without the confines of decorator magazine perfection. He can lay out his fishing gear and prepare for his next trip. I can paint in either the livingroom or dinning room when it isn't nice enough on the patio. The shape of space around the pictures in a grouping is very important in making an overall impact. Intuitively I have hung the largest paintings at the entry into the living room creating the impression that the wall is longer. The spaces between paintings is larger at the entrance than between the paintings at the end. The stair stepping of heights, and different sizes create an interesting negative space around the paintings. This shape around the pictures makes an overall casualness that impacts our feeling about how we want to live. the greater the need is for a larger surrounding empty space and order. Hanging next to the window is a painting called “My Palette My Table” in which I, with an open bag, stand small, practically unnoticeably harvesting lushious color. This painting is energizing to me but also is orderly because of the repetition of squares. Repetition goes beyond the painting. Squares and rectangles in my chair space include the stacking of abstract square paintings on the white wall, the lamp shade, the Guatemalian tapestry and the picture window. I view this island of energized order at our computer desk where I am immersed in an island of clutter, I am too close to the gallery wall to see the casually hung paintings but I do see Don's island of doings and an occassional hat or pair of sandals. For a rest I can turn towards the window and my corner chair with the energized large painting made orderly with repetition of squares within and surrounding the painting. Then beyond to the empty front door area with empty walls. A balance of motion and rest is not a newconcept to me but now I can apply with love to my relationship with my husband. It is as true in a painting as it is true when considering how to hang paintings in the architectural spacet o make a home our oasis of activity and rest. Coming in Part Two of How I Hang the Pictures I Paint will be about our dining area, kitchen and laundry room. I will share ideas on making better use of corners that get visually lost. Discuss museum wrap, frames and framing pictures with the architectural elements in the room. Part Three I will show my studio/storage with ideas for storing more art in a small space with easy access for making rotations throughout our home. I believe every painting collector has a different living space and different needs that their collection can satisfy. Collectors not only own a part of someone elses creativity but they can embark on a personally rewarding, creative journey of their own in finding what gives them the most satisfaction in how they display their collection. Perhaps some of the principles I have discovered here and the ones in future posts will be adaptable to your own collecting process. I hope you will share some of your experiences here in comments. I am still learning. That was interesting to me. I miss having long walls available here, but larger windows were needed for more light since we live under oak trees. I look forward to the rest of your tips. You might add one for how you decide where paintings should hang in a showing like the library. Hanging in a public space has some of the same considerations as hanging in my home. So I audition my work in my own home. I see how they work together as a group and what is interesting together. I make a paper map and plan where they will hang but invariably when the actually hanging occurs some changes in my plan usually occurs. I believe your home has some interesting ideas on how more art can be enjoyed if I may do a blog with examples your art collection and space would provide. The difference when it's the library is which work goes with the main collection room, periodicals, etc.? Then when it's a senior living facility, do you take into account their being old as impacting what they'll like? A lot of us will never hang a work anywhere but we will see it and might look with more sophisticated eyes when we think the painter had a purpose to what they chose and where it ended up. Exactly Rain, the pictures I select to hang at the library and senior assisted living facilities are geared to what the people there say they like. In my home I do not like hanging work I've done when I was releasing anger at whatever. When I am hanging work expecting clients i do not hang works that are family portraits. 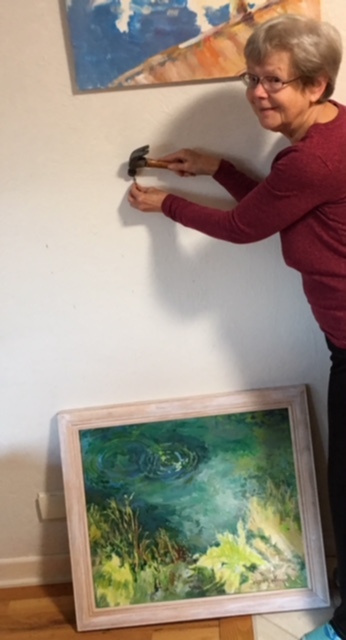 My hope is, if there is interest shown in what I have learned about hanging paintings, I will illustrate more ways to create the feeling of spaciousness while hanging more paintings. The empty or relatively empty space increases the power of the paintings to be enjoyed. This was very interesting and informative, thanks Diane & Rain. Gave me pause to think about my painting choices and how they have evolved over the years. I've moved so much that I have only kept a limited number that have meaning for me. Would love to see Rain's collection as well. I will definitely share that, Brig. I buy prints, posters as well as paintings with a variety of styles. We can't afford all of the work I love but luckily Diane has kept her prices within an affordable range and considering their size and quality, that's a real gift to lovers of her work. Good thoughts, Diane. Your room is lovely. My living room walls are chopped up by doorways, fireplace, a half-wall beside the kitchen entrance, and a large window right in the middle of the front wall. And it's relatively small to begin with. But I do try to use the remainder of wall for the most impact. My most interesting gallery is along a narrow hallway. It doesn't have enough light, but I still enjoy it. Yes, you have an email interesting collection of many artists and many media. Well worth talking about your experiences as a collector and practiced of several art media. Coming in this blog this Wednesday is the way the paintings are now hanging in my dining area, kitchen and open hallways entering into the largest space in our home. Martha, over the years I have seen how you hang your beautiful abstracts in your home. Your work has inspired me. Welcome to writing in the blogosphere! Interesting to read the artisr’s perspective on hanging your pictures.